The "daily" printing part of the Oregon Daily Emerald is no longer. 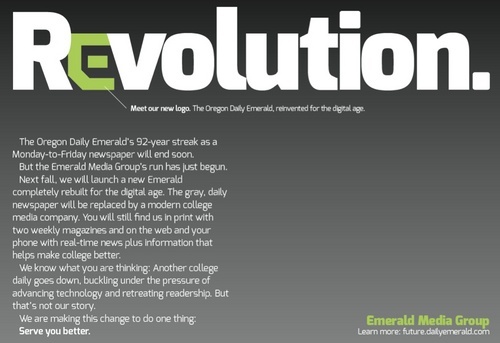 The student newspaper at the University of Oregon — best known for its five-day-a-week print edition — is morphing into a more wide-ranging, digital-first “modern college media company.” On a special site that went live last week, Ryan Frank, the publication’s publisher, outlined a number of major new initiatives that will be rolled out in full force this fall. To be clear, this is a big announcement within college media. The Emerald is the second high-profile student newspaper to dramatically reinvent itself this academic year, following in the digital-first footsteps of The Red & Black at the University of Georgia. Even in its nascent stage, the Emerald’s creation should serve as an instructional, inspirational model for other professional and student news outlets seeking to reinvent, truly reinvent, in the digital age. Most importantly, it was also an open process. The right way to carry out this type of reinvention is to gather input from as many camps as possible — staffers at all levels, related advisers and professors, student readers, the overseeing board, and alums of your outlet now working in the industry. Don’t invite sheer chaos, but embrace competing views and outsider perspectives. The day after the Emerald’s announcement, the New Orleans Times-Picayune unveiled a similar print cutback and online push. Yet, there was a big difference between how the two changes were handled. At the Times-Picayune, only top executives had a say, spurring immediate staff and citywide confusion and resentment once news of the plan was leaked. By comparison, the Emerald crew patiently built the foundation for the outlet’s next step atop feedback from everyone, specifically ensuring staffers in all areas and at all levels weighed in on how their roles might be best redefined. The result: a smooth initial rollout and an excited news team. 2) Take Control of the News Cycle. The most significant part of the Emerald reorganization: a news cycle power shift. Simply put, the staff fought the daily deadline gods — and they have won their freedom. Reporters and editors are determined to no longer practice “the journalism of filling space and time.” As digital managing editor Josephine Woolington said, “We don’t want to keep putting out a daily paper just to put out a daily paper.” Instead, staffers are preparing to both speed up and slow down their coverage, at their discretion and to everyone’s benefit. On the slowdown side, the drop to two issues per week enables step-back, big-picture, group-think about the identity and impact of each issue. The reprieve from an ever-present deadline also gives student reporters time to track down and flesh out more details, angles, and side-issues on the big stories. And, in theory, it enables every facet of every story to be fully vetted — the reporting, editing, graphical accompaniments, and overall design. Along with slowing down, the Emerald is speeding up. It is introducing a squad of “iPad-equipped digital news reporters” that will work all hours to report on big campus and community happenings. The Speed Team, as it’s been dubbed, is again about asserting control over the news cycle — not letting a daily deadline delay stories from reaching readers or leaving stories overlooked because of their timing. 3) Create Different Kinds of Beats, Brands. Within the scope of its redefinition, the Emerald is seeking to report news that no one else is covering, or covering as consistently, deeply, and through so many channels. To this end, the staff will unveil specialty blogs and something called micro-beats. Coined by Rossback, the micro-beat is a coverage area more specific or timely than most reporting beats, especially at the student level. Among the micro-beats the paper plans to cover come August: student debt, the business of college athletics (something the school knows a bit about given the heavy Nike presence), and declining state support for public universities (another issue of high current relevance at UO). Each one will be tackled by a veteran staffer throughout the academic year, macro and micro — from tweets and blog posts to video features and investigative reports. The result: Emerald staffers who become synonymous with their coverage areas and whose related knowledge and contacts base will breed confidence and better journalism. At a major college media convention earlier this spring, New York Times media reporter Brian Stelter told students, “Media in 30 years will be more about individuals than institutions.” For example, he said, the New York Times will still exist but be more a collection of well-known journalist brands than a singular journalism force. 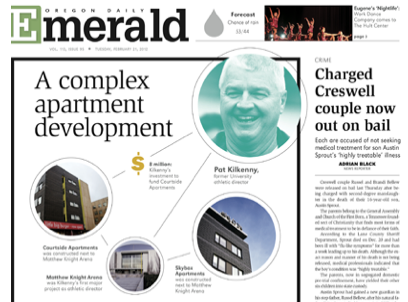 To better compete — or at least join the game — the Emerald is shedding its “gray, daily newspaper” identity. To start, the newspaper is now a magazine— a Monday edition mainly focused on meaty news and sports recaps (“Think Newsweek + ESPN Magazine”) and a Thursday edition with more features, leisure news, and weekend previews (“Think Rolling Stone + Wired + Vanity Fair”). It is also “trimming the fat” from stories and doubling down on making their relevancy clear to readers. 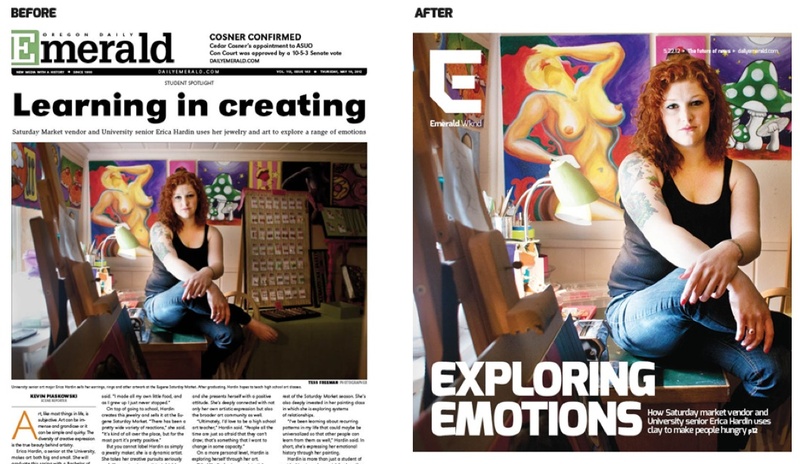 And it is upping the outlet’s visual A-game, adding an attractive cover page (a before-and-after front page example is below) and additional print and online photos and infographics. 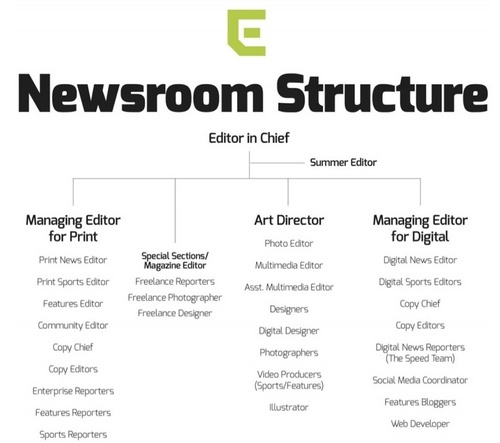 Emerald 2.0 is also aiming to be a digital nerve center for all UO information and entertainment. To this end, staff are tinkering with The Garage. The tech portal aspires to eventually provide online guides for all elements of university life including classes, professors, dining halls, housing, and employment. It will also feature real-time data streams and cutting-edge, quirky programs. 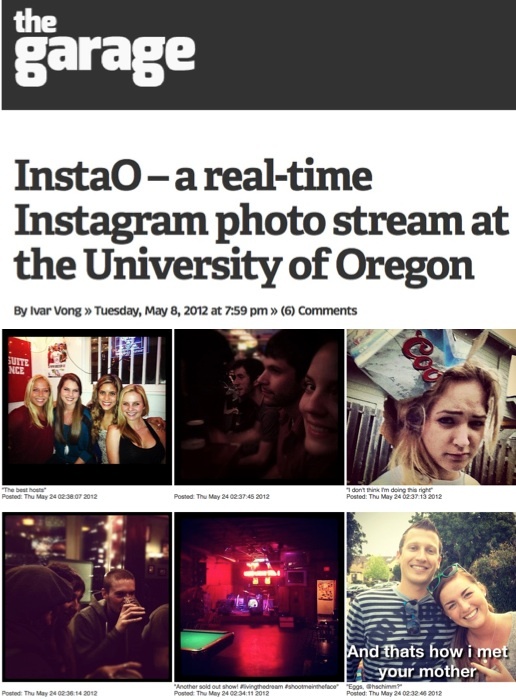 One program already running: InstaO, which grabs and features all Instagram photos submitted by users within a 4-kilometer radius of the UO campus. The API provides a unique glimpse at what students and community members are spotting, capturing, re-imagining, and sharing. Separately, Emerald Media Group is launching a marketing division to “deliver the campus to our clients” in ways a dead-tree advertisement cannot. Emerald Presents, an event services team, will be part of this new endeavor. 5) Be a Bit of a Maverick. Dedicated planning aside, top staff admit they’re not sure how specific portions of the overhaul will turn out. They are also cognizant of the possibility that the whole shebang might fail miserably. But given the gale-force winds of change swirling over the media landscape and the need for more student publications to truly pioneer the digital frontier, they view their attempts as well worth it. Dan Reimold is an assistant professor of journalism at the University of Tampa. He writes and presents frequently on the campus press and maintains the student journalism industry blog College Media Matters, affiliated with the Associated Collegiate Press. His textbook Journalism of Ideas: Brainstorming, Developing, and Selling Stories in the Digital Age is due out in early 2013 by Routledge.